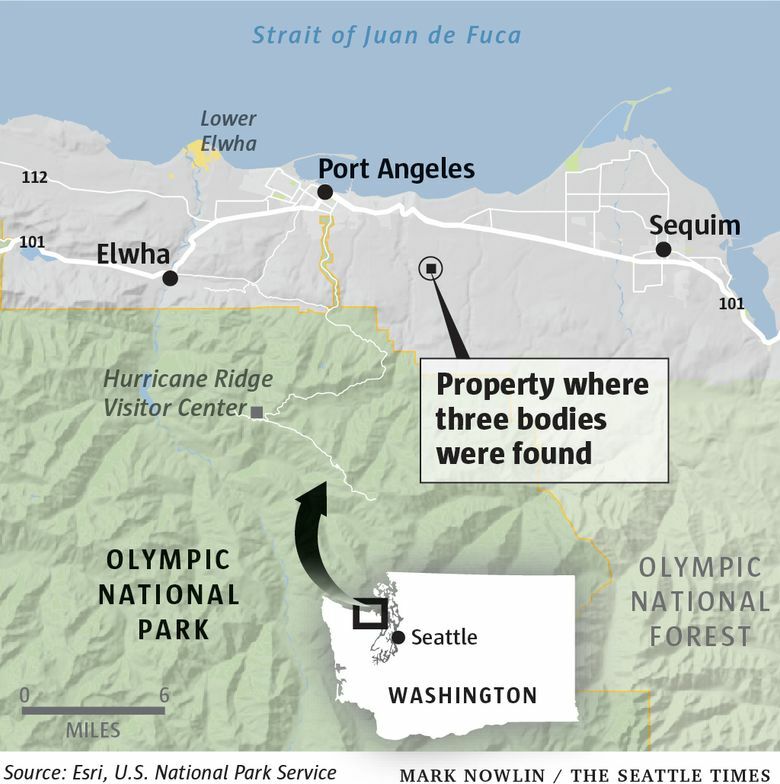 Authorities responding to a welfare check on a property near Port Angeles have discovered a grisly scene where three people were fatally shot — two hidden under debris and another inside a shed. Detective Sgt. John Keegan of the Clallam County Sheriff’s Office said Tuesday that investigators believe all of the victims had been shot some time last week and that many shots had been fired. Investigators don’t believe that any of the deaths were the result of suicide and are now looking to track down people who may know what transpired. Among the dead were 57-year-old Darrell Iverson and his son, 27-year-old Jordan Iverson, Keegan said. Their bodies were found on the driveway covered by tarps and other objects, including a bumper. The body of 26-year-old Tiffany May was found inside a shed on the property, Keegan said. May was Jordan Iverson’s girlfriend and had been living at the house. “It’s still a very active crime scene,” Keegan said. Keegan said authorities do not have any suspects but are looking to track down persons of interest, including others who may have been living at the property. They are also trying to establish a timeline of events but currently believe the killings may have occurred around Dec. 26. Authorities first went to the property Monday evening because a family member had called for a welfare check after not hearing from the residents of the property since Christmas. They found the first two bodies then. Keegan said investigators found the third body on the property Tuesday. Authorities don’t believe there are any other bodies on the property. Darrell Iverson’s sister, Wendy Peterson, said she and her husband had gone up to the house Monday to check on things. When they arrived, Peterson said, they discovered the front door open and decided to call law enforcement. Peterson said she wasn’t emotionally ready to talk in depth about her brother or nephew, but she said Iverson was born in Seattle, raised in Covington and had lived much of his life in the Port Angeles area. She said he was a hard-worker who would spend long hours on his logging truck and then spend time at home working to maintain the vehicle. She said Jordan had a troubled young adulthood but was recently getting his life back on track. Darrell Iverson also had another son who lived out of the state, Peterson said. Peterson said she doesn’t understand what happened, why it happened, or who might have been involved in the killings. Keegan said he does not have any concern over the safety of the rest of the community and believes whatever transpired was isolated to the property, which covers about five acres a few miles southeast of Port Angeles. Investigators have established a tip line and are looking for anyone who might have information. The number is 360-417-2540.